I had some computer troubles and I ended up having to get a new laptop, but I'm happy to say that I am up and running again. Yay! 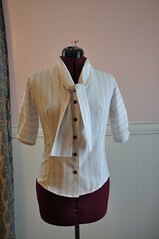 In addition to making historical clothing I also really enjoy making every day clothing for myself. I've spent the last couple of days working on the blouse for my Victorian naturalist outfit, but before I tell you about that, I wanted to share some pictures of my new tie-front blouse. I'm quite pleased with how it came out in the end, especially since it was my first attempt at a button up blouse and my first try at machine buttonholes. The buttonholes were super easy and I cant believe I've spent so many years being afraid of them! You may recognize this fabric. Its the leftovers from my stripey bustle I made for the spotty dress. 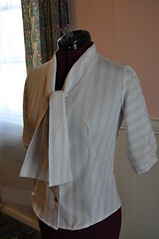 I had barely enough to make the blouse, hence why the sleeve stripes are horizontal and the scarf doesnt tie into a bow. But even though I could do what I originally planned, I love this fabric for the blouse. 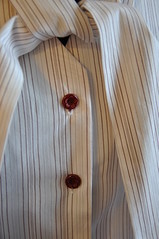 Here is a close up of the vintage flower buttons I used. Arent they adorable!